Growing up in the shadows of the Appalachian Mountains had a profound effect on me. I was fascinated by the history and the stories that arose from the hollows and ridge-tops of the Appalachians. They were tales full of adventure, hardships and love of family and these are the derivations of my own stories. I have written, The Morgan Family History, which I spent thirty years to research, and then compiled the information and put in book form. I found the research of this endeavor excruciating, but the writing process very cathartic. That prompted me to write my second book, Lost Then Found, which is literary fiction. It is based on my experiences while hiking the Appalachian Trail. I then spent several years writing a multitude of short stories, most about my hiking and climbing experiences across the United States. My latest work, Samuel, I consider my best. I look forward to the public's response to the sweet story of a young journalist from New York and a one-hundred-year-old, ex-slave from the backwoods of the Appalachians becoming friends. Two of the most unlikely people meeting and sharing a kindred spirit. Samuel: Usdi Yona is an historical fiction novel written by Jeff B. Morgan. Jonathan Newcastle was chafing at the bit as he boarded the train bound for Asheville, North Carolina. He was on an assignment to interview Samuel Timmons. Timmons was a one-hundred-year old African American who had been a slave and was of some historical significance, but Jonathan felt personally aggrieved at his editor’s decision to send him. Jonathan was, after all, a Harvard graduate and a journalist for the New York Times. Being sent into a backwater when so much of importance was happening in the world, especially now in 1939 when the country was poised on the brink of war, was demoralizing and frustrating. He began to wonder about his initial responses, however, when he met up with Allison McKinney, a young woman traveling alone, who had asked to join him in the dining car. An Atlanta resident, she knew of Samuel from overhearing discussions between her grandfather and others in his social and political circles. Jonathan mulled over what she said and read, once again, his notes which seemed to disclose little of note about the man aside from his advanced age. The driver who met Jonathan at the station was able to volunteer the fact that Samuel had legendary status in the area but had little more to add to Jonathan’s inventory. Several hours later, they arrived at the Glen Choga Lodge where he would be staying. After dinner, as he was outside enjoying the evening air and starry skies, he met Samuel, and his outlook on life was forever changed. 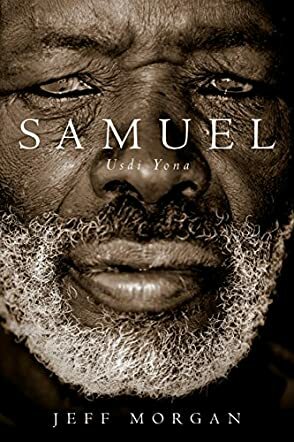 Jeff B. Morgan’s historical fiction novel, Samuel: Usdi Yona, is an intense and riveting novel that follows the life of the legendary Samuel from his early life as a slave and subsequent adoption by Cherokees to his later role as an elder statesman. Morgan deftly weaves fact and fiction while allowing himself no liberties with describing the way things were during those troubled times of segregation. His story refers to presidents, the Wright brothers, and the African Americans whose lives were so impacted by the discrimination they experienced and still do experience. I was stunned that the black actors who starred in Gone With the Wind were not allowed to be at the premiere, and saddened when I read later on about the problems Hattie McDaniel, who was the first black Oscar winner for her role in the movie, experienced even with being able to accept the award. Throughout the historical tapestry, however, what shines out above all is Samuel himself: his gentle nature, knowledge and the relationship that grows between him and Jonathan, who becomes his son in so many ways. Samuel is an unforgettable character, and this book about him is a brilliant tour de force. Samuel: Usdi Yona is most highly recommended.